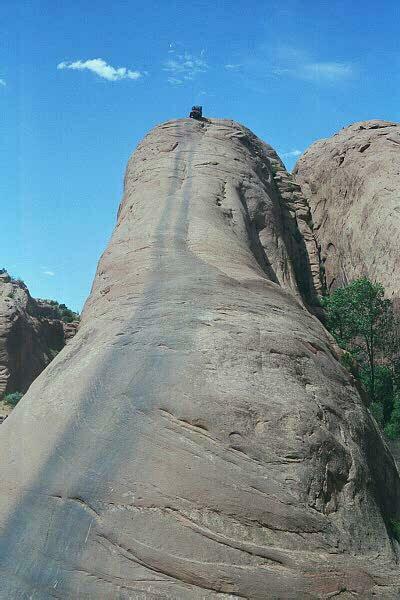 This rock is called Lion’s Back is near a town called Moab,Utah and is a sandstone ridge The close by rock is called “potato salad hill”. Usually, tough drivers who like to be challenged are coming here. They like to face the tough terrain and find satisfaction in the difficult driving. There is a big discussion on the Facebook whether this place is just a play of photoshop or real.? This incredible place, testing guts is near the city of Moab, state of Utah, USA. It is because of interest, the rock driving generates that it is called the “Lions Back rock” and has found a place in ” Amazing Stuff”. One has to drive several hundred feet up on steep climb and be prepared for descending from the precarious 3 point turn at the top, on either side there is dangerous vertical fall. So be very sure of your motives to attempt a ride through. Most of the drivers feel to be shaken by reaching the top. Cautious and smart drivers make resolutions for a safe ride. The awesome beauty from the top offers a good view to enjoy. The place is no longer freely accessible to all as it was bought by a private property. One has to pay a little fee to pass through. All the best for the challenge.